Nicole Chater and Jess Chebl are on the hunt for characters. 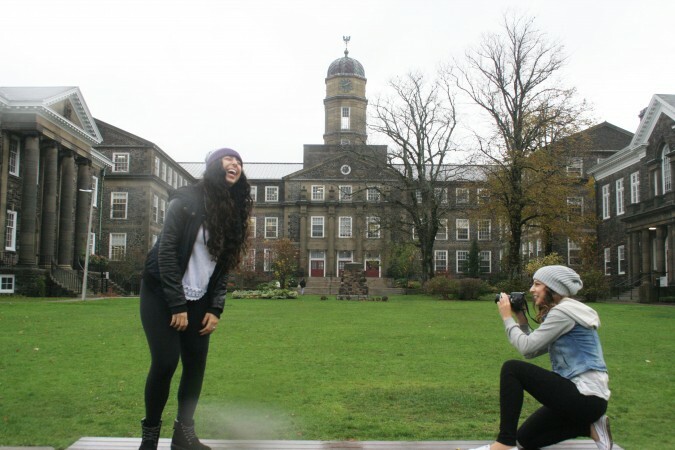 The duo scopes out personalities for their Facebook page, Humans of Dalhousie. The portrait-style photos are accompanied by a quote that reveals an untold story. “It humanizes people to know what the person beside you is going through,” says Chater. Chater, a second-year chemistry student, and Chebl, a third-year business student, met four years ago at a Mumford & Sons concert in Maine. Both are part of the large Lebanese population in Halifax, but had never formally met. Both are big travellers. Chebl was supposed to help out with Humans of Lebanon while she was there this summer, but because of political tension, the gig fell through. When she got back, Chater had the idea to bring Humans to Halifax. Like other street photography startups, the young women were inspired by Brandon Stanton’s Humans of New York (HONY) photo blog. Halifolks is a similar spin-off based around Halifax. There are over 500 “Humans of” photo blogs globally – and that number is growing. “We’re not limited to students. We’re limited to people who make the university the university,” Chebl adds. Since its debut just over a month ago, the page has gleaned 2,600 likes. Their fifth post featured The Dawgfather, the iconic vendor of hot dogs who has stationed himself outside the Student Union Building for years. It attracted almost 2,000 likes. “If we wanted to establish ourselves, we needed someone that everybody knows and everyone loves, and he was that person,” says Chebl. Getting strangers to talk isn’t easy. Many times people, and especially students, are pressed for time and rushing to class; other times, they’re nervous and unwilling to get personal. “Everyone has a story. It’s whether they want to share it or not and we respect it if they don’t,” says Chebl. Chebl and Chater have a set of questions — If you were to give a piece of advice to a large group of people, what would it be? What’s your biggest fear? What makes you happiest? — and an eye for character helps them stake out potential subjects. “We have ideas of the type of people we want to see. We want it to be cultured. We want to have different types of people. So we try to mix it up a lot,” says Chater. Chebl says eye contact and smiling are a good start. They usually go for people who are sitting alone, since it’s harder to do group interviews. “We’re creeps. So we walk around and we stand and smile and look at people,” jokes Chebl. The two have cameras, both do interviews and both alternate roles. They agree having the other there helps them to pick up on things they might not have otherwise noticed. Chater says so far, the most shocking interview they’ve done was with student Leah MacDonald. “After that interview we were like, ‘this is why we do this,’” says Chater. The young women don’t post all the photos they take, just “the ones that are relatable, or even the ones that are extremely unrelatable,” says Chebl. They hope to continue Humans of Dalhousie while they’re still at school, and are looking for helpers to keep their fan-base happy. “Disappointing the people who care about me,” says Chebl.